About: Hey I'm Amoris, if you have Veri specific questions/plot ideas, hit me up in her pm's, or DM me on Discord! Appearance: Lupus Form: 136lbs, 26in high at the shoulder, 38in long. Secui Form: 165lbs, 38in high at the shoulder, 46in long. Veri's primary fur is a cream with some light grey dusting on her ears, paws, and tail, and a very light biscuit kissing the underside of her belly up to her chest. Veri prefers to be in her Optime form, as most of her tasks require the dexterity of fingers to be complete. Most of her body is a canvas of scars, the biggest of them crisscrossed over her belly, back, and inner thighs, with a handful across her neck and face, the latter blinding her in her right eye so it's a duller blue than its twin. In her upright form they're more visible than her thicker furred feral shapes. The scars on her muzzle and wrists however remain plain to see in all three forms. Secui she primarily uses, nowadays, for big game hunting, as this form has more bulk to take down larger prey. 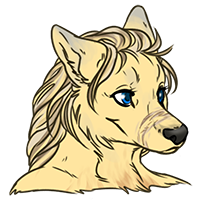 Veri rarely takes her Lupus form unless it's for hunting, traveling light without a horse, or romping with her children when they were small or have the urge. Personality: Veri grew up molded to be the perfect submissive female, by none other than her own father. He did heinous things to her to keep her under his thumb, under his influence. She remained this meek little slave until her future mate-to-be also became enslaved to her father, and he helped her break free, so to speak. Now, Veri Secanti is a strong willed, outspoken warrior of her pack. There are few she will back down from in a verbal confrontation, especially if she believes the other party to be incorrect. However, she won't dispute them if them come back with a valid argument to back themselves up, or a different solution altogether. As a seasoned mother, now, for children both her own and not, she is fiercely protective of her family. In a way, she is almost like a mother to most of the members of Casa, if not just the youth. All this time has only strengthened her unwavering patience. As a healer, and not just any healer, but the healer; as Chief Cheric, Veri now oversees the wellbeing for the entire pack through training the incoming Medics and communicating with the Farmers about the flow of medicinal supplies from the garden. As a healer, her word is law over her patients. Being in a pack of warriors definitely calls for her skills as a healer more than she'd like, however, when called upon as a warrior, she can bring the hammer down with the best of them on any foe who dares to upset the peace. Biography: Veri's child and young adult life was fraught with pain, forced submission, and isolation. She did not believe things could be any different; it had never been any other way. That changed when a male got caught by her father, and that brief interaction bolstered her confidence just enough to help the captured wolf escape. Afterward things got worse, and she got fed up. With some supplies gathered, her father drugged, she fled where she'd grown up for the first 16 months of her life into the utter unknown, knowing only one thing; she wanted to find that other male. Rurik. It's been years since this occurred and Veri is far from the meek little mouse she'd been forced to emulate. She's had five children, two of them being her own flesh and blood, the other three being orphans that she opened her home to at varying ages. She's a warrior, among one of the best in her pack as a Brotherhood member. Not only that, but her title, Master of Medicines, depicts her as a top tier healer. Just recently her talents were recognized in an even stronger way by way of promotion to the Council as Chief Cleric, meaning she oversees all things medical, herbal, and health related throughout the entire pack. Her father, the tormentor of her youth and young adult life, is now dead. Oh, and that male Veri had been chasing down since leaving her father's? Well, finally, after a long awaited, oblivious courtship, they tied the knot and became mates. She's at home. She's happy.